(Nanowerk News) Arizona State University engineers will work as part of a new national center for research and innovation in small- and medium-sized drinking water systems. The Design of Risk Reducing, Innovative Implementable Small System Knowledge (DeRISK) Center will develop and test advanced, low-cost methods of reducing, controlling and eliminating water contaminants that present challenges to communities worldwide. The U.S. Environmental Protection Agency (EPA) recently awarded more than $4 million to the University of Colorado-Boulder to establish and lead the center together with Arizona State University, University of Alaska Anchorage, University of New Hampshire and the Rural Community Assistance Partnership as partners. The center’s focus will be on the kinds of smaller drinking water systems that make up most of the public water systems in the United States. Many of the systems face obstacles, such as limited resources, aging infrastructure and a lack of capability to comply with Safe Drinking Water Act regulations. The center is envisioned to serve as a hub for collaboration between the universities and various state and local government agencies, private-sector organizations and the Canadian small water systems network. “By its selection to be part of this EPA-funded multi-university center, ASU is again being recognized as one of the leading research institutions in developing solutions for safeguarding the environment and public health,” said Kiril Hristovski, who will lead the ASU team. Hristovski is an assistant professor in The Polytechnic School, one of ASU’s Ira A. Fulton Schools of Engineering. 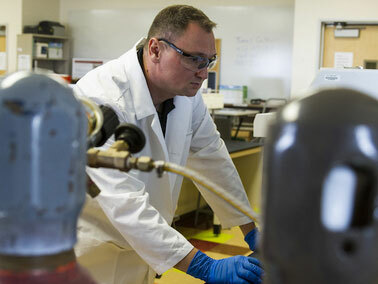 With the goal of eliminating water contaminants that present challenges to communities worldwide, Kiril Hristovski is leading a team of ASU researchers that is part of a new national center. His research partner on the project will be Paul Westerhoff, a professor in the School of Sustainable Engineering and the Built Environment and ASU’s vice provost of academic research programming. The ASU researchers will focus on developing novel photochemical-based applications, including both sunlight and engineered light sources, to improve water quality and provide effective photon-based water treatment for small systems. “The ultimate goal is to develop novel and sustainable technologies for photocatalytic water treatment that can move us closer toward using sunlight to convert nitrate and other contaminants to innocuous end-products without addition of any chemicals. Nanomaterials will play a central role in this research endeavor,” Hristovski said. As part of the center’s activities at ASU, the researchers plan to develop and prototype novel nanomaterial-based treatment technologies, which can remove nitrate and other contaminants, such as hexavalent chromium, from water by photocatalytic reduction. Nitrate was selected as a model contaminant because it represents a key component of the nitrogen cycle. The sustainable management of the nitrogen cycle on a global scale is designated by the National Academy of Engineering as one of the Grand Challenges for engineers in the 21st century. Estimates suggest that more than 24 million people in the United States alone are affected by nitrate contamination, making it the most ubiquitous contaminant in drinking water sources that poses high risk to human health and the environment. “Nitrate is high on the International Agency for Research on Cancer priority list for upcoming review of possible carcinogenicity,” Hristovski said. “Hexavalent chromium is already a confirmed carcinogen, and many may remember it as the focus of the Erin Brockovich story. Development of novel technologies that could eliminate these contaminants from water is of critical importance in the national and global effort to protect public health and the environment,” he said.